12mo, 4 pp. Bifolium. Good, on lightly-aged paper. Attractive engraving of a blackberry cutting. 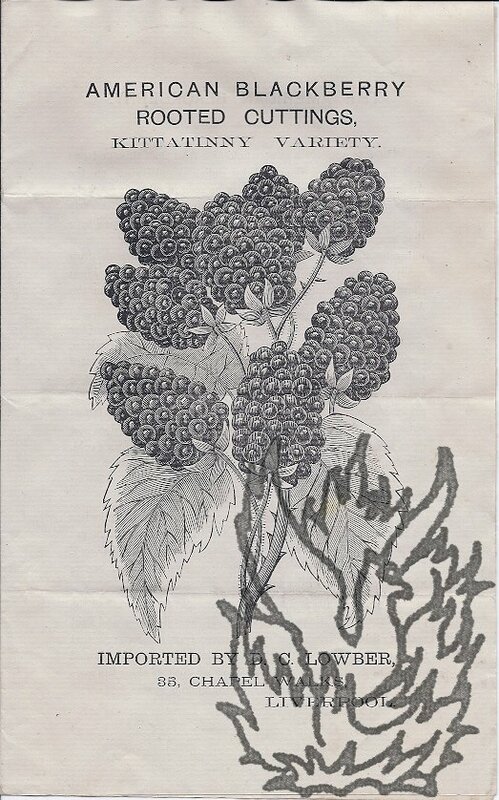 The second page is headed 'THE AMERICAN BLACKBERRY', and begins 'There is scarcely a more wholesome fruit than this, and one that has been more improved by judicious cultivation on the American side of the water.' The text, which continues to the last page and is signed in type by Lowber, contains two quotations from 'Rev. 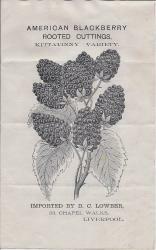 E. P. Roe, one of the most celebrated small fruit culturists on the banks of the Hudson'. In manuscript at foot of third page: '15/- per doz. cuttings | or single specimen for 1/6 | by P. O. order'. Hailing from New Orleans and a Confederate sympathiser during the American Civil War, Lowber had been released from custody by the Union in 1862, on condition that he 'return to England' and do nothing hostile to the United States. He was reported as arriving in New York from Liverpool, in New York Times, 21 May 1873.